Located in the vast of the Indian Ocean lies the island of Sri Lanka. With friendly local, consistent and super cruisey waves, Sri Lanka is a top destination on most surfers’ bucket lists. Sri Lanka has attracted many swathes of surfers from around the world since it emerged into the global surf concious. Three of the earliest surfers to pioneer surfing in the nation were Marky Mark, Jaya and Dunstan. To other islanders they’re known as the first-generation surfers, the originals who’ve dedicated their lives to wave riding. Aussie native Marky Mark ventured out to Sri Lanka in 1976 at the age of 21, where he met Dunstan. One year on they befriended a bubbly, enthusiastic surfer Jaya. The three bonded in a way you only can when three people share a love of surfing. With good breaks and plenty of rice and curry to stock up and refuel on, they made surfing their lifestyle, Sri Lanka their home, and each other their family. 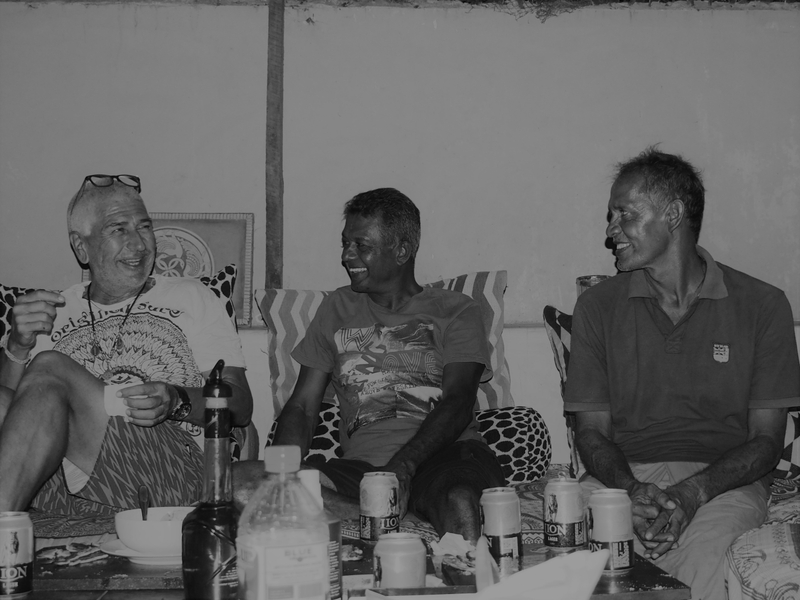 Four decades on this still rings true, as Dunstan now guides surf tours around the island and has his own self-titled brand of board shorts and Jaya spends his days either fishing or guiding increasing surf tourists along the East coast. As the three sit, discussing their first boards, it’s clear that their passion for surfing is as strong as the very first time they caught a wave. Marky Mark recalls the shape of his 9’6”Gordon & Smith Tracker a tone of nostalgia in his voice, as if it was sitting right there on the table. Dunstan smiled and looked down as he explained how he snapped his Southern Comfort 6’6”. 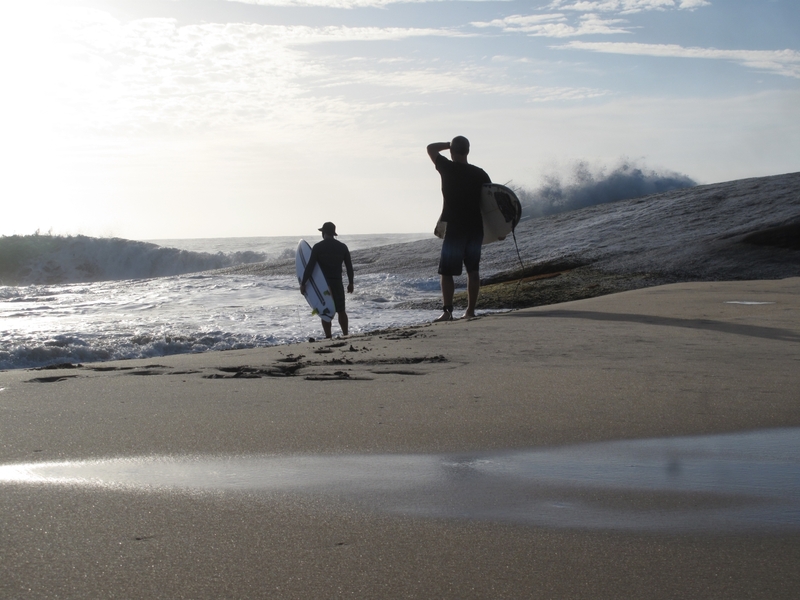 It’s a feeling no surfer forgets. Lastly, Jaya explained how he would outstretch his body and ride waves long before he owned his first board, a Timber. Surfing in an age before the internet, drilling holes in their fins to tie to a leash, and living in a country plagued with natural disasters and civil war; the stories are endless and never dull. What was even more remarkable was to see them in their element. With surfboards strapped to the roof, they set off down a well-known pilgrim’s path through grasslands at dawn. They arrived to an empty break adjacent to large grey rocks and the waves were pumping. Dunstan was first in the water and carved effortlessly up and down waves with complete control. He stands erect and relaxed dropping in on waves that a seasoned surfer may second guess. Every few rides he took a break to catch his breath or cool in the shade. Then, he paddled back out to steal the show once again. To no one’s surprise, Jaya ripped with no sign of stopping. The only time he was seen without a smile was when he would crouch low on his board in a wide stance and whiz down the face of a wave in total concentration. Otherwise, he was grinning ear to ear and cheering others on. At this point, Marky Mark had yet to enter the water. Once ready, he cautiously entered the surf and proceeded to outlast everyone in the water with the tenacity of a 20-year-old. Mark glides high on the waves and cutbacks so forcibly his body appears horizontal. He is now 61. When asked about the future of surfing, the boys grew uncharacteristically quiet. It’s a complex issue, especially in Sri Lanka where the rise of surf tourism has skyrocketed over the years. Once untouched breaks, are now rife with inexperienced crowds and line-ups can feel like a battleground. After much debate, the three agreed that it’s all about respect; the young must respect the old, the newbie must respect the expert, the tourist must respect the local, and the reverse is just as true. “The ocean belongs to everyone”, Dunstan concluded as Mark and Jaya nodded along. Marky Mark, Dunstan, and Jaya are true pioneers who made surfing their lifestyle long before the world knew it was possible to do so. They’re old school, they’re still charging, and they have enabled younger generations of surfers to prosper. These three surfers have acted as an inspiration to others, and not just other surfers but surfing companies too. HABU, an acronym for Hook A Brother Up is a surf gear company that intends to honour them and make gear to their standards: laid back and looks best with salt, sweat, or stains. So if you’re looking for an epic surf session or want to follow the lifestyles of these guys, visit Sri Lanka and follow the waves.